On the way back from the Frankston Motor Registry, my Singapore-born nephew, now the proud possessor of his P-plates, drove confidently and in a celebratory mood. I was happy that learner had turned ‘chauffeur’ so that I could revert to one of the idle contentment of life – reading aloud from a new collection of poems without pressing interruptions. I decided to try out The Poem Relevancy Test with a couple of random pieces. In his early twenties and now at university, this post-modern Everyman communicates mostly through text message and is one of the vast majority of non-poetry readers. 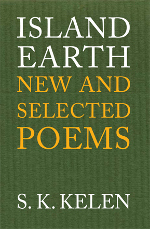 Thus, Island Earth: New and Selected Poems became the tome for some stick-the-finger-in-the-page bibliomancy while we motored through death-camp quiet suburbia.